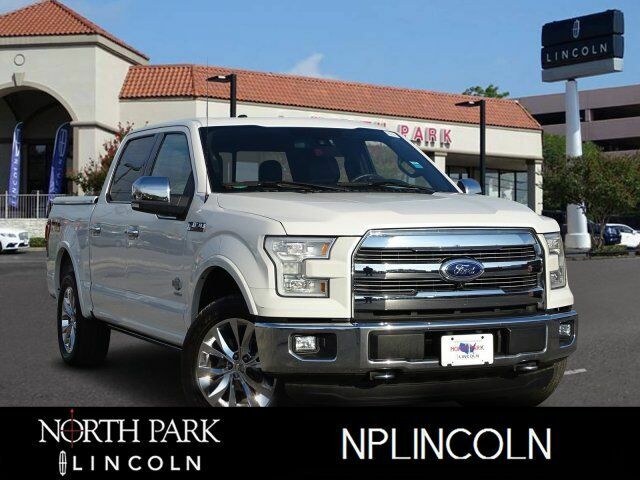 Nav System, Heated Leather Seats, Moonroof, 4x4, Turbo Charged Engine, Bed Liner, Hitch, ENGINE: 3.5L V6 ECOBOOST, EQUIPMENT GROUP 601A LUXURY, ADAPTIVE CRUISE CONTROL & COLLISION W... TWIN PANEL MOONROOF. CLICK NOW! Leather Seats, Navigation, 4x4, Heated Driver Seat, Heated Rear Seat, Cooled Driver Seat, Premium Sound System, Satellite Radio, iPod/MP3 Input, Bluetooth, Trailer Hitch, Remote Engine Start, Dual Zone A/C, WiFi Hotspot, Heated Seats. MP3 Player, Keyless Entry, Privacy Glass, Child Safety Locks, Steering Wheel Controls. EQUIPMENT GROUP 601A LUXURY Inflatable Rear Safety Belts, Multi-Contour Seats Driver and passenger, Blind Spot Information System (BLIS), cross-traffic alert sensor in taillamp, Tailgate Step w/Tailgate Lift Assist, Power-Deployable Running Boards, Wheels: 20 Machined-Aluminum, light Caribou painted pockets and Caribou wheel ornament w/Caribou King Ranch logo, Automatic High Beam w/Rain-Sensing Wipers Windshield wipers, Tires: P275/55R20 OWL Automatic Transmission (4), 275/65R 18 OWL all-terrain spare tire, KING RANCH CHROME APPEARANCE PACKAGE accent wheellip moldings, 2 chrome front tow hooks and tailgate applique, Chrome Skull Caps on Exterior Mirrors, Wheels: 20 Chrome-Like PVD, Caribou wheel ornament w/King Ranch logo, Chrome Front & Rear Bumpers, chrome end caps on front, Chrome 3-Bar Style Grille w/Chrome Surround, chrome mesh insert, Tires: P275/55R20 OWL Automatic Transmission (4), 275/65R 18 OWL all-terrain spare tire, Chrome Door Handles w/Body-Color Strap, Bright Belt Moldings, TWIN PANEL MOONROOF, ADAPTIVE CRUISE CONTROL & COLLISION WARNING brake support, TECHNOLOGY PACKAGE Lane-Keeping System, 360 camera w/split-view display and dynamic hitch assist, SPRAY-IN BEDLINER (PRE-INSTALLED) Custom Accessory, ACTIVE PARK ASSIST, ENGINE: 3.5L V6 ECOBOOST.